It’s Girl Scout cookie season and I’ve got a treat for you. Healthy and simple (but incredible!) 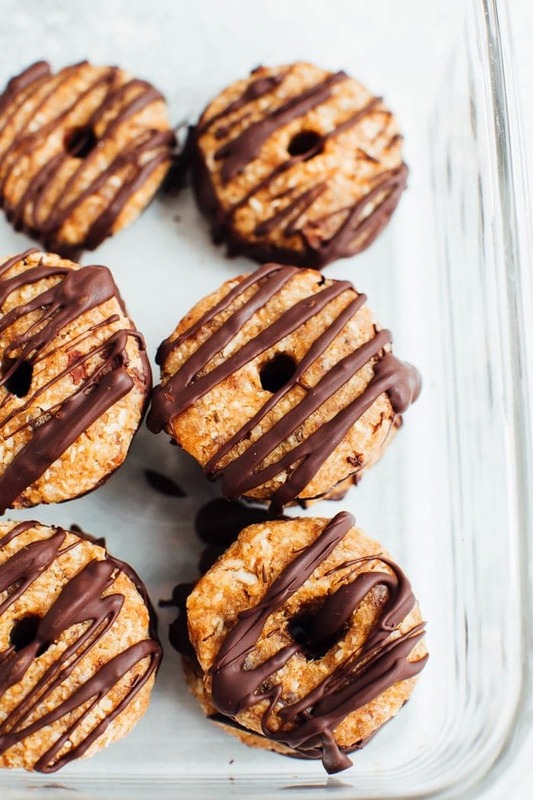 4-Ingredient Samoas that might just taste better than the real deal. Shh…. don’t tell the Girl Scouts. Vegan, gluten-free and paleo-friendly. 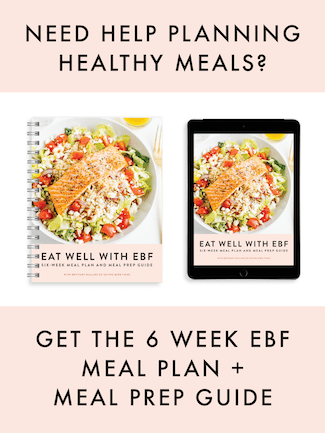 Sometimes I feel like this weird pull between having a blog with amazing recipes and my real life meal planning which often consists of simple, delicious meals. Don’t get me wrong, I still make and enjoy all of the recipes on my blog but more often than not, eating looks much simpler. SO, lucky for you, I’m going to start sharing more minimal recipes that are made with 5 ingredients (or less!). Life is busy and eating healthy shouldn’t have to be expensive, take a lot of time, or take a lot of energy. I know I teased this a little but I can’t hold it in any longer. I’m have a new eBook for you! 35 recipes with 5 ingredients or less. Grab your copy here! 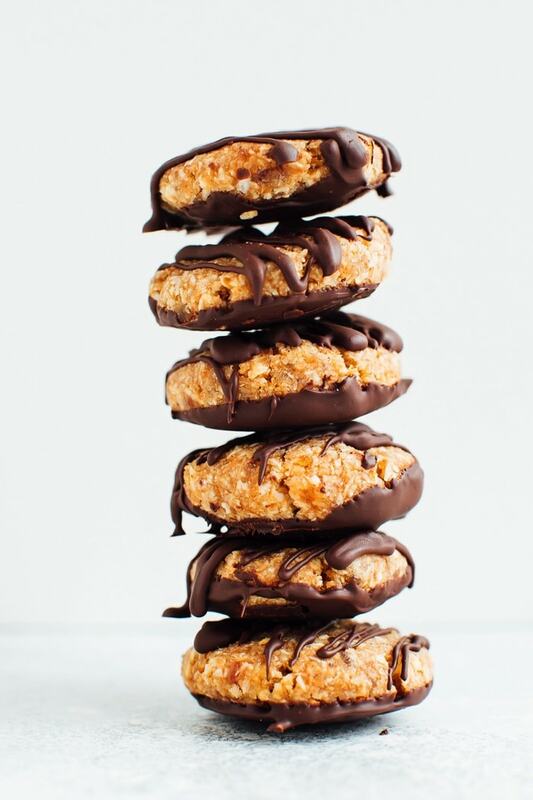 In the meantime, I’m excited to share these 4-Ingredient Samoas. They are created in honor of everyone’s favorite Girl Scout cookie. Okay, so maybe Samoas aren’t everyone’s favorite, but they’re definitely Isaac’s and my favorite! Thin Mints are a close second over here. If you’re on team Thin Mint, I highly recommend you check out these Thin Mint protein balls! 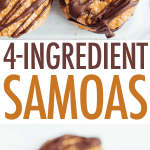 I actually already have a recipe for samoas energy bites, but this version is a bit more simple in terms of the ingredients (just 4) and looks almost exactly like the real deal. The idea for these babies was actually inspired by Meaghan of Plant & Simple Eats. She brought similar cookies to an Instagram meet up we had a year or so ago and I knew I wanted to make my own version! 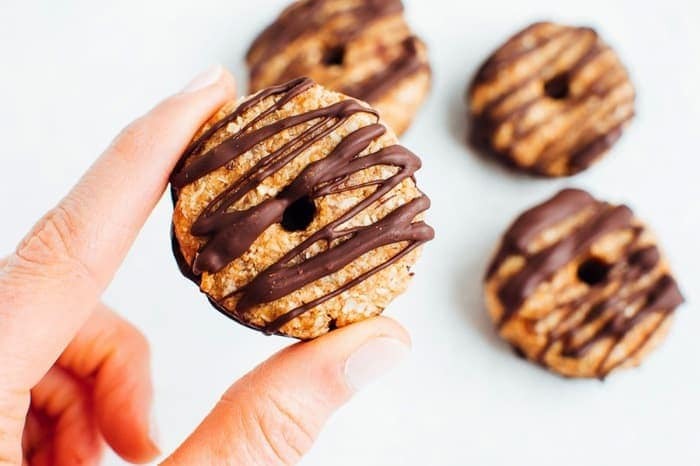 These samoas couldn’t be easier to make so instead of having to wait for Girl Scout cookie season every year, you can make these year round. YES! Healthy and simple (but incredible!) 4-Ingredient Samoas that might just taste better than the real deal. Shh…. don’t tell the Girl Scouts. Vegan, gluten-free and paleo-friendly. Pre-heat oven to 400°F. Spread the shredded coconut onto a baking sheet for toasting. Place in oven for 5-10 minutes, until coconut is a light golden brown color. Make sure to stay in the kitchen watch the coconut, as it can easily go from toasted to burnt. Alternately, you can toast the coconut in a pan on the stove-top. 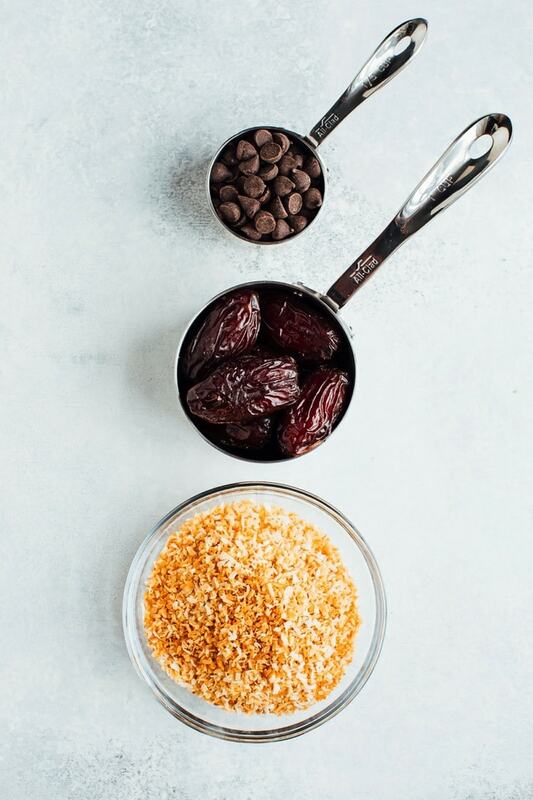 Add dates and toasted coconut into the bowl of a food processor. Pulse until mixture is combined and starts to form a ball of dough. Remove from food processor, roll 1 Tablespoon size pieces of dough into a ball and then shape into a round cookie. Using a straw or chopstick punch a hole in the middle of the dough. Move the straw or chopstick around a bit to make the hole wider, if needed. At this point you’ll likely need to reshape the cookie a bit. Place all cookies on a sheet lined with parchment and transfer to the freezer to harden up a bit. While cookies are in the freezer, add chocolate and coconut oil to a shallow microwave-safe bowl and melt in 20-30 second increments until the chocolate is melted enough to drizzle. Grab cookies from the freezer and dip each one in the chocolate to coat the bottom. Place cookies on the parchment and use remaining chocolate to drizzle over top the cookies. Transfer cookies back into the freezer for 10-15 minutes to let the chocolate harden. Once they’ve hardened you’ll be able to easily remove the cookies from the parchment paper. If you want to enjoy right away, let them sit out on the counter for a few minutes. For enjoying later, store in a sealed container in the fridge for up to one week. ???? I’m so excited to try these! Samoa cookies are my absolute favorite, but I’ve shed away from making them because of long, tedious recipes. These sound amazing! Thanks for sharing! Also, I’m super excited about your ebook! These sound awesome! Can’t wait to give them a try. These cookie look so delicious! I love how easy it is to make them! 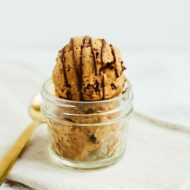 These look so yummy, I have been looking for some new gluten free snacks to get making so these will be perfect – it can be so hard to make them taste good but these sound amazing. Thanks for the inspiration, I better get cooking! These look so amazing! If I don’t have a food processor, is it possible to use a blender instead? I haven’t tried these in a blender yet. What kind of blender do you have? I’ll try these cookies very soon. How many cookies does it make? The recipe makes about 11 cookies. I tried these and my dates and coconut would not form a dough. It was just a bucket of “crumbs”. Any recommendations? It’s likely that your dates were a little dry. Try adding a little water to the mixture, 1 teaspoon at a time until it starts sticking together. Just made these and might decide to keep them all for me! I tripled the batch – made about 35 cookies. They are SO amazing. Better than the originals (sorry Girl Scouts) – try them right out of the freezer – YUM! I made a double batch, and they are so yummy! my husband liked them too! 🙂 I added a little coconut oil to my date and coconut mixture to help it bind together better. Amazing!!! I absolutely love these and so does my husband. Who was very skeptical to even try them. After he did, he was hooked and said “How can these be so darn good with only those ingredients?” He has already asked me to make more. Thanks for coming up with and sharing! These were AMAZING! My husband who is a strict chocolate chip cookie eater, even enjoyed these (repeatedly). Wonderful! I just made these and tried one as I took them out of the freezer. I haven’t had a samoa cookie in 10 years and you think these 11 will last a week in the fridge?? ???. Definitely 5 stars! Thank you for coming up with the great recipe!! 135 calories each cookie? That’s a high calorie count for just one. Am I missing something? I dont like Coconut , Could I used oatmeal instead coconut? Delicious! I tried to make the holes, but they crumbled so I tried again and left them as little domes from being packed in my tablespoon. Maybe my dates and coconut were still too chunky? But it didn’t matter, because they look and taste delicious. I’m storing them in a glass container in the freezer – I love frozen samoas! Just made these, and they are crazy awesome delicious! I made a note to triple the recipe because we ate them immediately. I added 1/2 tsp of vanilla and topped them with a bit of sea salt. Great recipe!! Jonathan doesn’t even like sweets and he loves these. They are even better than Samoas. Not too sweet and coconutty! My husband went out to get me the ingredients i needed basically as soon as I saw this recipie. Two hours later the cookies were made and WOW theyre phenomenal! Thank you!! What is the gadget you used in the video to drizzle the chocolate? It’s just a plastic bag with the corner snipped off. It makes it so easy to drizzle chocolate. Yes! As long as you use dairy-free chocolate chips. These look amazing, but 17gm of sugar per cookie is a lot. Do you have any lower sugar options? Could you use cocoa and coconut oil for the top, or would that not be thick enough? Did i get something wrong. Hi Irene. They’re definitely not a low calorie food — just a healthier treat made with real food and simple ingredients. I’m sorry if you were expecting something else. These are soooo good! I’ve made them twice and once for the holidays. They are really easy. I just make them in smaller batches and they are easy to make. My husban even loves them and he’s a cookie connoisseur. Make sure you put them in an air tight contianer and refrigerate for the best results! I saw this recipe and headed straight to my kitchen because I knew I had all of the ingredients. They were so quick and easy and turned out fabulous! What an awesome recipe. My coconut did burn after only 3 minutes so I would suggest a lower temp and really watch it. I did big flakes though so maybe those burn faster. Thanks! These are so yummy and easy! Only 3 minutes needed to toast the coconut. I also soaked my dates in warm water for a few minutes before processing. Delicious eaten out of the freezer for 1-2 mins. I’d like to try these, but I don’t like shredded coconut. Could I sub in coconut flour? If so, how much? Thanks! I’ve never made them with coconut flour so I’m not sure! substitutions for the dates ?? prunes or soaked raise s work? I haven’t tried the recipe with anything but madjool dates. I think it could work with another dried fruit but you won’t get the same caramel flavor that the dates provide. 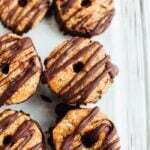 Wasn’t so sure about these bc Samoas are my Girl Scout jam but these are AMAZING and healthy!!!! Thank you for sharing!!! So so delicious! I am so excited about these cookies. I love them and will be making more again soon. I love your recipes. Thank you for sharing another amazing one. I made your thin mints a couple weeks ago and commented on how delicious those were and now these are another family fav! These are incredible and SO EASY to whip up. I put off making them for so long because I am not used to buying/using medjool dates, so I thought it would be overwhelming to take the pits out and overly sticky/messy in the food processor but it was a breeze. These will be a staple in my house. These cookies are absolutely amazing. 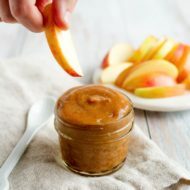 So healthy, not too sweet, and so quick and easy to make. Thank you for an amazing recipe. OMG!!! 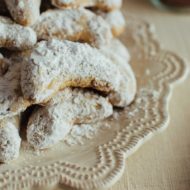 I just made this recipe and I am hiding the cookies from my husband and son. They are so delicious and super easy to make. Absolutely delicious and my yield was 14, so mine must be a bit smaller. Even easier to shape the second time around. Thanks Brittany!